I was originally planning on writing a complete travelogue of our trip to the Philippines last Christmas season. After giving it more thought, I decided to just retell the more interesting events and curious aspects of our vacation instead. This way, I wouldn’t be too overwhelmed by the task of writing about our trip. So, here, I’ll talk about our three-day vacation in Bohol. When we were still living in Manila, we’ve never really ventured too far from Manila. The farthest I’ve been to was Cebu and I did that only once because my Dad used to work in Cebu. In Luzon, the farthest I’ve been was Lucena, Quezon to visit my Tito Pogi’s (aka Teddy) family there. Anyway, Raquel and I wanted to a beautiful and interesting tourist spot in the Philippines that is far from Manila and isn’t Baguio. The choice came down to the Sagada hanging cemetery or Bohol with its Tarsier and Chocolate Hills. We opted for the latter. I thought I’d rather see the beach, wonderful unique-looking hills and the smallest primate in the world than see a bunch of vandalised coffins hanging from a cliff wall. Although, I was told that despite the vandalism, the hanging cemetery still looks cool. Still, I wanted the less depressing option. We booked our flight from Manila to Tagbilaran City (Bohol’s capital) two days after our arrival in Manila from Melbourne. We wanted a couple of days in Manila to do some additional shopping for things we might need for our stay in Bohol. We also had our Australian Dollars exchanged for Philippine Peso so that we’d have some local currency to use when we get to Bohol. Wanting to see the inside of the newer NAIA2 (the international and domestic airport apparently reserved only for Philippine Airline flights and its affiliates), we picked Philippine Airlines return flights. It was only at the airport after my parents dropped us off that I realised that we have forgotten to bring a few things with us. We didn’t have our usual identification cards, for example. Fortunately, I still had my Victorian drivers licence with me while Raquel only had a very old ID from when she was still working in Makati (and still single) and a credit card that showed her new surname. Still, the guard at the airport entrance and the check-in personnel both let us through to the terminal. Soon, we’re up in the air. When the airplane captain announced that we were about to land, Raquel and I both looked out the tiny window of the airplane to see what Bohol was like from the outside. Right then I told Raquel that I wished we had booked for a longer stay than three days. It was beautiful. All the coconut and banana trees and few nipa huts. I love seeing scenery like that. Anything that takes me back to when I was younger while visiting the provinces. Then the plane landed. We stepped out on to the tarmac. We were at the Tagbilaran airport. However, to my surprise, it was just a relatively small building. It reminded me of a busy bus terminal near Pasay City except smaller. I guess I shouldn’t have been at all surprised. It was a small town after all. When we walked out of the airport building, we were suddenly approached by this mob of shouting people carrying signs with names of hotels, resorts and people. They were all drivers looking to get passangers. Coming from Manila, I wasn’t at all sure if we could trust these supposed drivers at all. I was fully expecting these people to rip us off. I wanted to take a taxi with a proper meter on it but unfortunately, according to the airport guard, those come in rarely to the airport. Since we probably wouldn’t be able to get a legit taxi, we sought out a driver that could take us to our hotel, the Alona Palm Beach Resort. The other drivers were at least kind enough to point out the guy who supposedly services our hotel. The driver, Bong, greeted us and directed us to his car. It was a white sedan that had no special markings to distinguish it from any other private vehicle. When I got in, there wasn’t an identification card hanging from the rear view mirror neither. That got me a little anxious, to be honest. 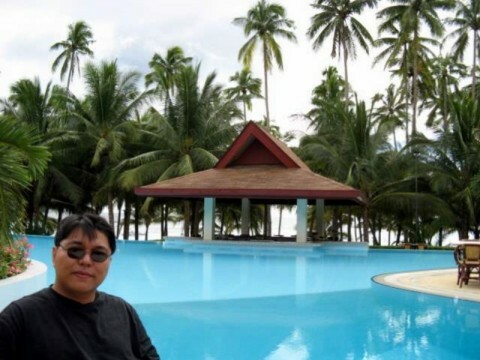 We only have Bong’s word that he works for Alona Palm Beach Resort at that point. While on the road, he called up his office to confirm that we are heading for the hotel. That certainly help lessen my anxiety about our situation. He also loved telling jokes and that helped, too. During the trip to the hotel, I noticed how the roadside slowly became less and less uninhabited. First there were buildings then next there were just nipa huts and old houses made of wood in view. For a moment, I feared that we were going to be abducted and held for ransom or something. Well, thank God it was just me being a worrywart because soon, we were pulling into the resort driveway. Apparently, we were too early having gotten there at about 10 AM. The room we had booked won’t be ready until 2 PM. In the meantime, we were supposed to just hang around the lobby while we wait for our room to be vacated and cleaned. That’s a four hour wait that we would rather not waste sitting around. We left our bags with reception and then we headed straight for the beach with the intent to explore the surroundings. Near the beach, we noticed a groundskeeper eyeing us from afar while he was sweeping the ground. Actually, he pretended not to be looking but I caught him several times eyeing us. He was slowly sweeping towards our direction until he was only a few feet away from us. He stopped, looked around suspiciously, then looked at us. “Uh-oh,” I thought. This could be trouble. He continued with his sweeping then said, “Psst! Sir. 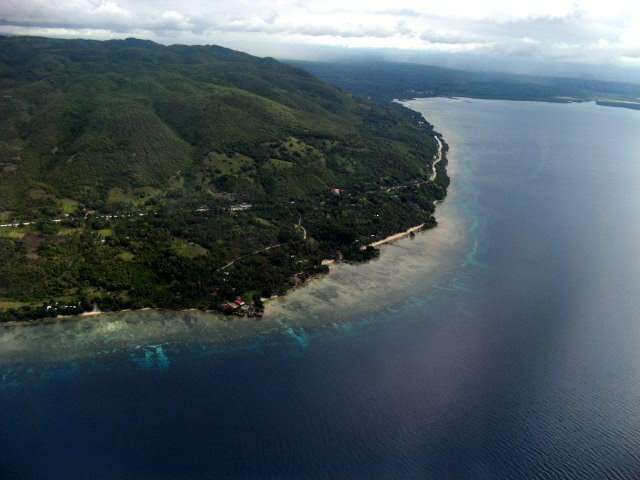 Do you want a boat ride to Balicasag (island)? Only P1,200, sir.” For a moment there, I thought he was going to offer us something illegal. But then, maybe offering hotel customers boat rides on the side was something that wasn’t allowed for him to do which would explain his suspicious behaviour. “Sorry, but we don’t have a lot of money with us,” I said. And that was the truth, too. We stupidly left behind the our local cash in Manila. “Ah, ok. How about P1,000, sir?” he asked. Although we weren’t haggling with him, it was an interesting offer nonetheless. Either way, we were telling him the truth. We didn’t have a lot of money and we would rather spend that on the tour the next day. We had contracted Bong the driver to show us the sights the next day for only P2,000. That’s actually cheap since there were only the two of us and we have him booked for the whole day. We said no again to the groundskeeper and continued to follow the path along the beach. From where we were, the path seemed to go through a bunch of nipa huts. We followed the path wanting to explore what was beyond the huts when a couple of ladies dressed in a white coat and white pants intercepted us. What was it now, I wondered. “Sir, do you like a shiatsu massage?” one of the lady asked. If we were just going to be fending off people left and right as we walk the path, we might as well just head back to the hotel. And that’s what we did. We ate lunch at the hotel restaurant (which was a bit expensive but, hey, it’s a hotel) then just sat at the reception area to wait for our room. It was warm and we were tired. I couldn’t help but fall asleep right there. I must’ve been snoring loudly or otherwise embarassing the hotel personnel there because we were informed at about 12 noon that our room was finally ready. Yes! The room was spacious and gorgeous. And, most imporantly, it had airconditioning. We just spent the rest of the afternoon holed up in that room. We only came out again after dark for dinner. 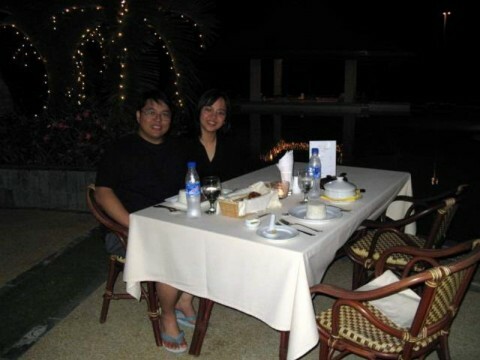 Again, we had our dinner at the hotel restaurant but this time, it was by the swimming pool. It was a romantic ambiance with the pool glowing blue while Christmas lights where hung from the coconut trees. The food we ordered was actually delicious but still quite expensive. When we finished our meal, we decided to try walking around the beach again. I was hoping that since it was already dark, there wouldn’t be a lot of people who would be hassling us. I was right. We were able to go past the nipa huts without anybody trying to sell us something. And what lay beyond the nipa huts were more resorts! As it turned out, there were a lot of resorts along Alona beach and Alona Palm was just the farthest one. So, when we walked along the beach, we were able to see what the other resorts were like. All of them had this barrio fiesta feel to them. There were bands playing, people grilling seafood and having drinks or simply enjoying the atmosphere. We then realised that we could’ve saved some money if we had eaten our lunch and dinner in one of the restaurants along the beach. Darn. At least, we also found out that there was an information centre along the beach where we could access the Internet and have our Australian dollars exchanged for Pesos. And we also learned that there was a cheaper place where we could have dinner next time. After spending a couple of hours by the beach, we returned to the hotel. We don’t want to tire ourselves too much because we’re supposed to get up early the next day for the whole day tour with Bong. I’ll just continue the story in another post. We’ve been busy these past weeks with work, chores and general everyday living that we’ve been neglecting some of our more leisurely pursuits, this blog included. Hubby has been planning a detailed post about our Bohol trip but he’s just too occupied with other things at the moment that he hasn’t gotten around to it yet. Man, you should really hear him talk about our adventures, or maybe misadventures; it’ll give new meaning to the words impassioned story telling! Anyway, next best still is to see the photos we’ve taken during said trip. Note that you’d have to have a SnapFish account to view the entire album. Yes, we’re back in good old Melbourne and loving it. We’ve actually been back since Monday but four days onward I’m still feeling a bit sluggish. Our three-week vacation over the holidays in the Philippines was okay even though it didn’t exactly meet my extremely high expectations. Let me explain. I left for Australia in November of 2000 and I haven’t spent Christmas in the Philippines since the last one. That’s six Christmases spent abroad. I have very fond memories of Christmas and New Year’s Eve growing up. Whenever the Christmas season rolled in, I would look back on those fond memories and think of how I’m missing out on all the fun. And so, I was very excited to spend Christmas at home again after all this time. My expectations were unrealistically high, in fact. I guess, in retrospect, I was just setting myself up for some bit of disappointment. It’s like I’m expecting that this recent Christmas should match or trump the best ever memories I have of past Christmases. Not to say that the recent holiday season was bad, though. It just didn’t feel more fun than past ones. Maybe it was because there weren’t as many street light decorations as before. Maybe because not all of my closest relatives were in the Philippines to celebrate the holidays with us. Maybe I’ve just grown too old for it all. Or maybe, I unrealistically wanted a recreation of a cherished memory of Christmas and didn’t get it. However, I still loved that fact that I was able to spend the holidays with my Dad, Mom and little brother (who isn’t all that little anymore). I missed them being away from home for so long and I was glad to have been able to spend those few precious days under the same roof with them again. Although my overall trip home had been somewhat stressful and had not meet my great expectations, I was still glad to have spent some time with my family again. I’ll write up the more interesting experiences we had during our vacation in later posts. And thanks to everybody who had wished us well on our trip. Two office colleagues came in later than usual this morning with another transportation tale of woe. Train services were cancelled and people heading towards the city were left to use overcrowded buses and trams. Public transport users in this city had to deal with late and cancelled trains in the past with a myriad of excuses coming from Connex. Flooding, signalling problems, lack of drivers and faulty trains were only some of the explanations put forward by the company to explain their spotty service. So what’s different this time? This time, Connex may not be entirely to blame as thieves helped themselves to overhead lines used by the rail. These lines contain copper wires and with copper prices soaring worldwide, the thieves risked getting electrocuted by high voltage live wires just to make a quick buck. The first time I heard of stealing electric cables for the copper was when typhoon Milenyo struck Manila in October. Power lines downed by the typhoon were also stolen by thieves then, even electric poles were not spared. Consumers were the ones who suffered having to go without electricity for several days as the electric company struggled to replace everything. It seems like everything could be sold for a price these days and as long as there’s a market for it, thieves would risk life and limb to get it. However, it is not only simply copper wires that these thieves are stealing, it is also the time and productivity lost by thousands affected by their selfish act. Raquel and I are both avid fans of NCIS (Naval Criminal Investigative Service), an American TV series about an criminal investigative branch of the US Navy. Although it might first have been mistaken for a CSI wannabe, NCIS deals more with cases that involve Navy personnel and Navy assets. They not only do forensics, but they are also federal agents so espionage and counter-terrorism action is also to be expected. But the main draw of the show for us is the humourous banter between the lead characters and the common geeky exchange of the more geeky characters (such as Abby, Agent McGee, Palmer and Ducky). I gave this show a try when it was starting out only because Donald Bellisario is the executive producer of the show (as well as an old TV fave of mine, Quantum Leap). Okay so it’s obvious that we love NCIS. But that’s not the reason why I wrote this post. The second to the last episode of Season 3 titled Hiatus (Part 1) was shown on Channel Ten last night. Yes, for you Americans out there that are already into Season 4, Australia is usually behind on TV episodes so we only got to watch it last night. Anyway, at the beginning of the show, the NCIS gang were at a pier inspecting a ship and its crew. One of the crew members showed his passport and guess what? It’s a green passport with the words “Pasaporte” and “Pilipinas” on the cover. Yep. It was a Philippine passport. It turned out that the passport was forged so the guilty “Filipino” made a run for it. Agent Leroy Jethro Gibbs (just think of him as the Optimus Prime of the group) gave chase. Thankfully, it turned out that this seeming Pinoy bad guy was actually an informant and the chase was only for show. It was a good start but I found it difficult to suspend my disbelief later on due to some of things shown in that particular episode. The main one is that the NCIS is after a Filipino terrorist that goes by the name of Pinpin Pula. What kind of Filipino name is Pinpin Pula? Okay, given that this supposed Filipino terrorist probably lives in Mindanao and not in Manila, maybe the surname Pula is popular in Mindanao but it certainly isn’t in Manila. And the first name, Pinpin? From observation, most Filipinos would either have an old Spanish-sounding name (such as Gabriel, Mariano, Jose, Manuel, etc. ), an Anglicised name (such as Peter, Jason, Dexter, etc.) or an Arabic name if he or she is a Muslim (though I don’t personally know a lot of Filipinos with Arabic names so I couldn’t give you a list of common examples). Pinpin sounds more like a Chinese name and Chinese-Filipinos would probably give their children Spanish names (to make it sound more Filipino) or Anglicised names. Well, according to Dr “Ducky” Mallard (of the NCIS team), the name Pinpin Pula is supposedly Tagalog for “rice paddy dike”! Really? Where did they get this? Is it that difficult to find a Filipino in the USA that they couldn’t get a more authentic sounding Filipino name and get its meaning correctly? We had to laugh out loud when we heard the supposed meaning. And so that one bit of inaccuracy sort of ruined the episode for me. I couldn’t take it seriously after that. It was a bit funny that they pronounce Abu Sayyaf as Abu Sayyif but I guess Sayyif could be a more accurate pronunciation in Arabic. Locally, Filipinos pronounce and spell it as Sayyaf so it was just a bit weird to hear it pronounced another way. However, Agent Ziva David (an Israeli Mossad agent assigned to be part of the NCIS team) pronounced Sayyaf as is. And she also pronounced Pula as you would expect a Filipino would. Looking at the actress’s bio, I found out that Cote de Pablo (who played Agent Ziva David) was born in Chile and grew up in Miami. I suppose it’s because she speaks Spanish that she got the pronunciations “correctly”. There was also a fun tidbit in the show. While the team was looking for leads, it was suggested that they talk to all the Filipino sailors. Then Agent McGee pointed out that there are over 250,000 Filipino sailors! I tried to verify the numbers but couldn’t. I wouldn’t be surprised if it was true though as most Filipinos know at least one person who became a seaman. Part 2 of the two-parter would be shown next week. I hope that I could suspend my disbelief again by then. We’re going back to the Philippines for a much anticipated vacation in December and thinking that it may be a good time to visit some of the country’s tourist attractions as well, I originally set my sights on a 2 day/3 night stay somewhere in Palawan. However, the idea didn’t sit well with hubby, who wanted to go somewhere where there are more things to do and see than swimming and sun baking on the beach. 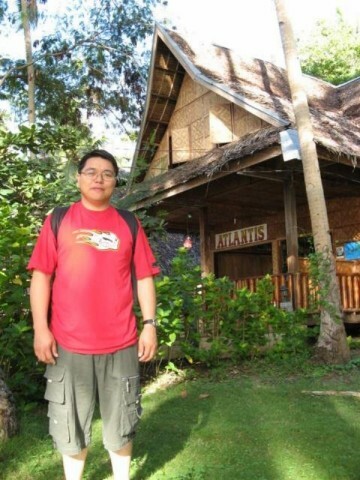 He wanted to see the tarsiers and the chocolate hills in Tagbilaran, Bohol and since its nearby island of Panglao is dotted with beach resorts as well, we thought it the best compromise for a travel destination. Knowing nothing about where to stay in Bohol, I lurked at Filipino forums PinoyExchange and Female Network for some ideas. Both have good threads on Bohol accomodations, tours and travel agencies. Most of the travel agencies and resorts never reply to emails. People who answer the email don’t read it properly or try to understand it. When I say I’d be needing a room for a couple, I didn’t expect the person to come right back and ask, how many people? Information is given piecemeal. If you ask for prices, that’s all you get. People who answer the emails won’t even qualify what the prices quoted is for (Is it per night per person? For the whole stay for all people? What are the inclusions?) Several exchanges of email would be required just to clarify these things. Some travel agencies push customers into choosing a particular resort. For example, I asked for room rates to two resorts and the agent said that the first one is good, then proceeded to give quotes. No mention of the second resort at all. Maybe because the first one is a bit more expensive, I don’t know. Some resorts quote their prices in US Dollars and nothing else. This one really irked me, why the hell would the prices be in US dollars when you’re in the Philippines operating a local business?!? This practice reeks of elitism and exclusivism. Owners are sending the message that your Philippine peso (or any other currency for that matter) is not as good as the US dollar. I glanced at their price list once and looked elsewhere. Other resorts have a different price list for Filipinos and another for foreigners (yes, in US dollars!). In most cases, the prices for Filipinos are a bit cheaper than the ones quoted for non-locals. Although I understand that this is to encourage Pinoys to visit local attractions than go abroad, it also made me uncomfortable. Why the discrimination? Filipinos are proud of being a hospitable people but asking a foreign guest to pay premium price suggests otherwise. I considered cutting costs by booking flights with smaller airline, Cebu Pacific, but changed my mind after reading MarketMan’s travel woes with them. With limited time to spend on holidays, I don’t think the cheaper price justifies shody service and lost time. In the end, I booked our flight online with Philippine Airlines and if their online booking is to be believed, the booking is confirmed. As for accomodations, we went with Alona Palm through Accomline. It came out cheaper and hassle-free than if we went with any of the travel agencies who replied to my emails. Now the only thing to think about is organising the tour and finally getting there. Can’t wait! Every weekend, Raquel would ask me what dishes I wanted to eat the coming week. I have a list of my current favourite dishes with me so that I wouldn’t forget. However, one dish I loved so much when I was younger was unfortunately absent from my list. Growing up, I loved it when my grandma or my mum would cook Bistek (Filipino Beef Steak). The dish is basically dried beef steaks cooked in soy sauce and some onions (our family cooks it with potatoes, too). Unfortunately, since Raquel and I have both cut down on eating beef and pork (and lamb) for a over a year now, I haven’t tasted Bistek in a long long time. One day, Raquel tried cooking a dish that usually needs lamb but replaced it with turkey instead. The end result was that the texture of the turkey was similar to that of the texture of Bistek beef. So, Raquel and I thought that maybe she could try cooking Bistek with turkey chops in place of beef. And that’s what she did. She boiled the turkey chops first until they were cooked and then she fried them and that was used in place of beef in the Bistek dish. Since there is no beef in this variant of the old Pinoy dish, we couldn’t rightfully call it bistek anymore. So, we dubbed the dish Terstek (get it? Turkey Steak?). It was easy to forget that I wasn’t eating beef. I absolutely love it. Well, this dish is certainly going into my favourite dishes list. Last weekend, Raquel and I went all the way to Chadstone (we consider this far despite the car travel time of only 40 minutes) to catch a movie. Not just any movie though. It’s a Philippine-produced horror film titled Sukob (translated as “The Wedding Curse”) by Chito Rono and starred by Kris Aquino and Claudine Barretto. I only discovered that this film is currently being shown here in Melbourne a couple of weeks ago entirely by accident. I was looking at the Hoyts website for films coming out this year. I was then surprised to see a film titled “Sukob” on the coming soon list. Sukob is a decidedly Tagalog sounding word so I drilled down further to find out that it was in fact a Filipino film. The film was only going to be shown at the Hoyts Cinema in Chadstone for one week which started last Thursday (August 31) up till this coming Wednesday (September 6). So, we had to watch it last weekend or end up not watching it at all. I’m not that much of a fan of Philippine cinema when I was still living in the Philippines. But now that I’m living abroad, I’m more appreciative of anything that reminds me of my country of birth. That meant, I couldn’t pass up the chance to see a film in Tagalog shown in a cinema that’s here in Melbourne, whatever the quality of the movie may be. Fortunately, it was a relatively good film. Certainly scary. I must admit that I haven’t been that scared after watching a movie for a long time. I found it better than Chito Rono’s other recent horror film, Fung Shui. It reminded me of other Asian horror flicks such as The Ring, Gu-on and the Eye. Well, the horror-feel was similar, at least. As for the story, it revolves around the Filipino superstition that it is extremely bad luck (as well as bad form) to get married in the same year a family member died or to get married in the same year as another sibling got married. In the film, the offenders weren’t just unlucky, but were pursued by a supernatural entity that exacted punishment upon those who break the Sukob rule. It was too bad that there weren’t any English subtitles. Otherwise, I would’ve recommended my Aussie friends to give it a fair go. But then, I’m not sure they’d understand the superstition behind the story. I’m also unsure how to explain to a non-Asian how easily we believe someone claiming to have psychic powers of some sort. In the film, the protagonists sought the help of a niece who is tuned in with the pretenatural world and an albularyo (a shaman). I just thought that it might ruin the suspension of disbelief of a Westerner. I guess that’s why in the American remake of The Ring, they didn’t make the kid’s father a psychic unlike in the Japanese original. Anyway, if you are interested in watching a scary horror flick, can understand Tagalog and live in Melbourne, you have until Wednesday to watch it at Chadstone. So, you better hurry. Today, my friend Arnold sent me and a bunch of our friends an e-mail with the subject, “Our New National Hero.” It has an attached image in sepia colours. Click here to see the photo or the thumbnail. My first thought was, “is this supposed to be Jose Rizal (the Philippines’ National Hero)?” But I knew that it just couldn’t be. Jose Rizal was one of the most photographed (and painted) of the Philippine heroes from the 19th century and I believe I’ve seen a lot of those photos (and paintings). And this wasn’t one of them. I’m starting to think that this is just one big joke so I replied to Arnold’s e-mail asking him up-front who this person is supposed to be. He replied to saying that it was Jose Rizal. I didn’t believe him though. Of course, those of you who are in the Philippines or following the goings-on in the Philippines would recognise immediately the face in this photo. I, however, didn’t. I then assumed that this was one of those e-mail hoaxes that is claiming that this is a long lost photo of Jose Rizal. And so, I set out to disprove the authenticity of this photo. I scoured the Internet for photos of Rizal but all I got were mostly just different versions of Jose Rizal’s portrait commonly found in the old 2 Peso bills. The other photos I have of Rizal were in the Philippine history books I have stashed at home so I couldn’t reference those. As a last resort, I even wrote an e-mail to renowned Filipino historian, Ambeth Ocampo, to ask his opinion of this supposed photo of Jose Rizal. I couldn’t stop laughing. Now that he mentioned it, I realised that it was just Manny Pacquiao! I should’ve known. And if I had been following the boxing news from the Philippines, I might have been more familiar with Manny’s mug. HAHAHAHA! I feel like such a fool. I should’ve known. Unfortunately, I’ve been in Australia for far too long that I didn’t follow Pacquiao’s boxing bouts. Although I know who he is and I’d probably recognise him if he is pointed out to me as Manny Pacquiao, I’m not familiar with his face enough to pick him out of this photo. And now I know for sure that my “friend” is definitely having me on! Hehe. Ah well. Thank you for humouring my question anyway. 😀 I truly appreciate it. I apologise for the inconvenience. Arnold, mate, you got me good! Edit: The photo is claimed to be created by Dung Markus.